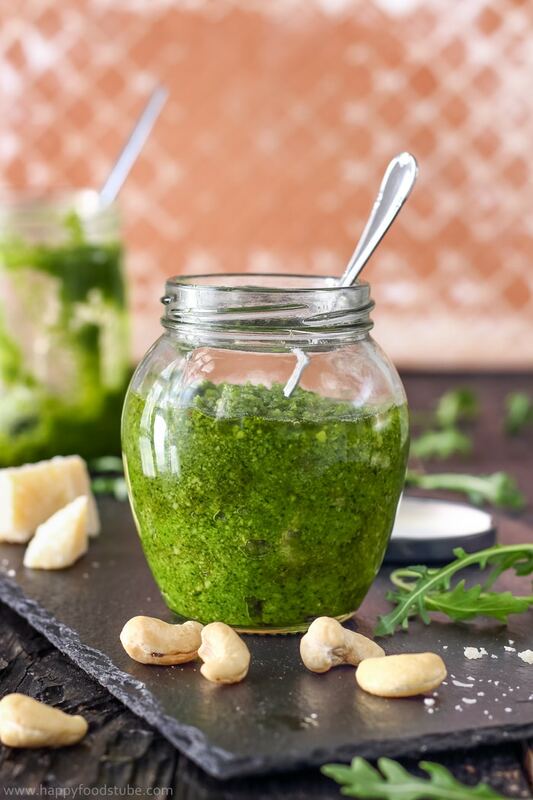 Homemade cashew arugula pesto. 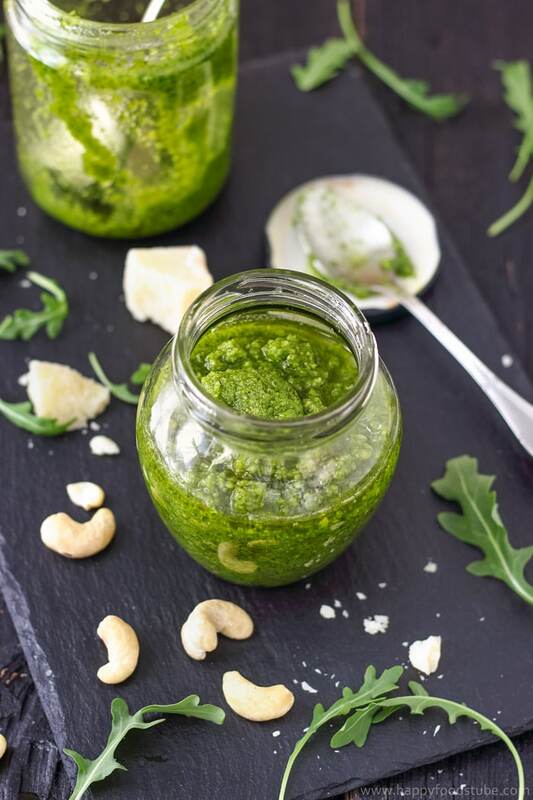 This pesto is made with cashew nuts, arugula leaves, garlic, extra virgin olive oil & Parmesan. Perfect for pasta or canapes! 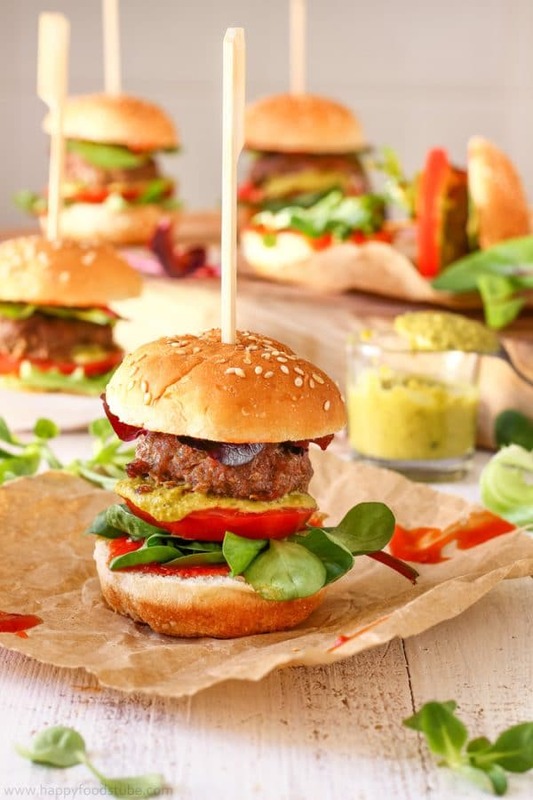 Vegans – just omit the cheese, add more arugula leaves, cashews and olive oil and you can enjoy it as well! I am in love! 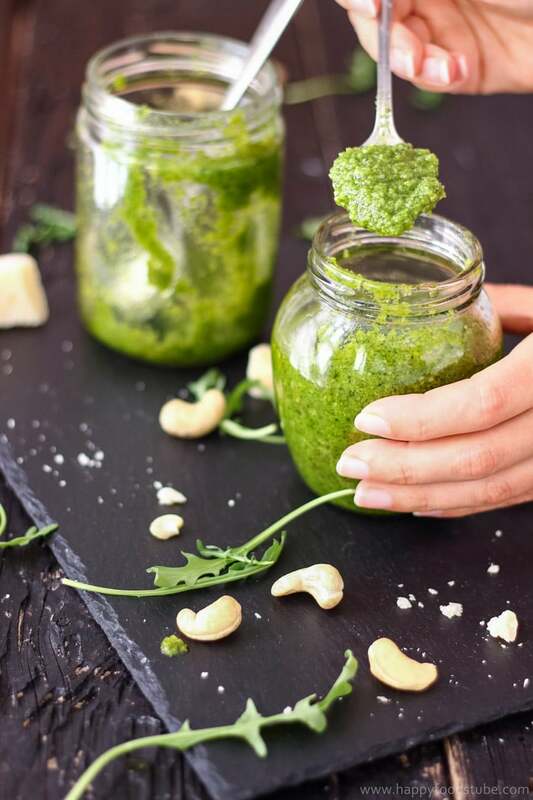 I made this cashew arugula pesto and can’t get enough of it! Seriously! It is that good. Now I have this old food magazine called F.O.O.D. at home. So this whole magazine issue is about Italian cuisine and dishes and anything Italian. 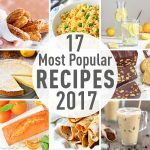 Now you might already know that I love anything Italian, especially pasta, pizzas or antipasto platters! So in this magazine I see 4 different pesto recipes. I don’t know why I had not tried making them before. I really have no idea because I tell you this – they are good. Ok, I’ve only made 2 of them using ingredients I had on hand but both of them turned out pretty good. I think you can’t go wrong with making homemade pesto of any kind. 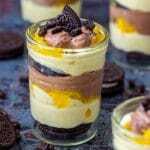 And those who haven’t tried making one I highly recommend doing so. About 2 years ago I had a go at making the authentic Italian Basil Pesto with pine nuts. I loved it! But pine nuts are quite expensive so I have made it only a few times since. What a shame I tell you this. Because it is not only about basil and pine nuts. I know it now but I didn’t know it back then. OK. Let’s get to the point: In this magazine I see arugula pesto recipe. I have arugula in my fridge! So I literally run to the kitchen to try it. Like that very moment. Without reading what other ingredients there were! I soon found out that their arugula pesto recipe WAS about basil after all. But hey, I wasn’t going to run to the shop to get some. 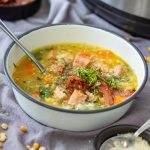 I experimented with the few ingredients I had in my pantry and the result is well worth a try! 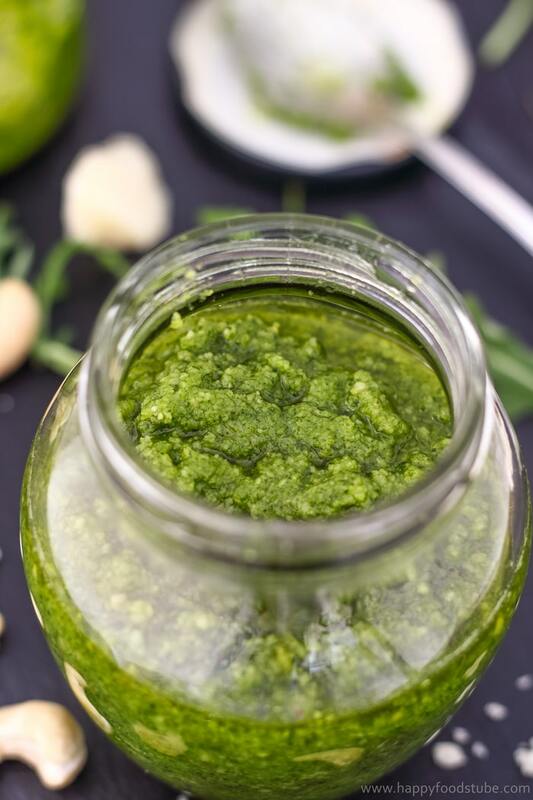 I created a very easy arugula pesto recipe. 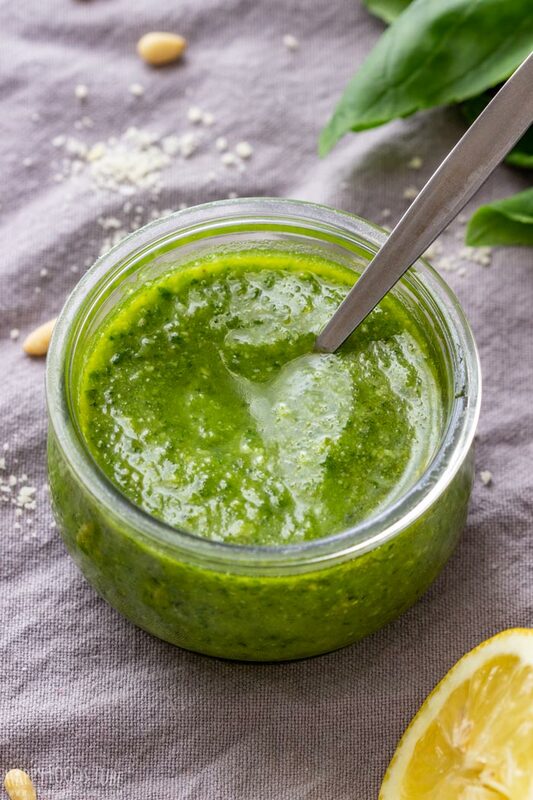 To make this homemade pesto you will need 5 ingredients. These ingredients should be available in most stores: arugula, extra virgin olive oil, Parmesan cheese (or equivalent), garlic & cashew nuts. Arugula, olive oil and cashew nuts are the most important ingredients here. 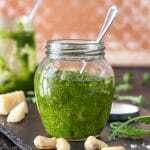 In this cashew arugula pesto recipe I stated amounts but these can be adjusted to your taste. You can also omit the cheese if you want and serve it separately. I also liked it that way. 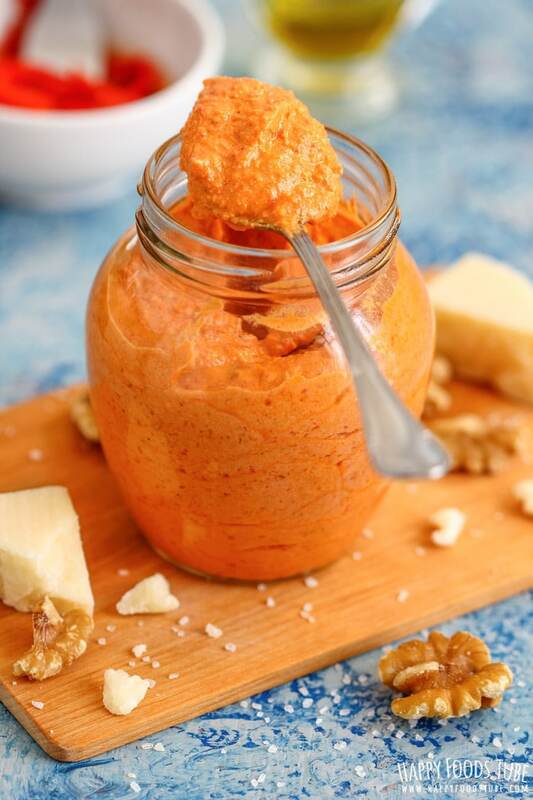 All the ingredients except for the cheese are mixed in a food processor until smooth-ish. At last, cheese is stirred in and you are ready to serve! 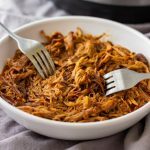 Store it in the fridge in a jar. If stored properly, it should last 4-5 days. Arugula – this is the main ingredient so it is a must. Parmesan cheese – omit this or use equivalent (i.e. : gran Padano, Pecorino). 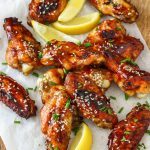 Garlic – you can omit garlic, if you don’t like it. 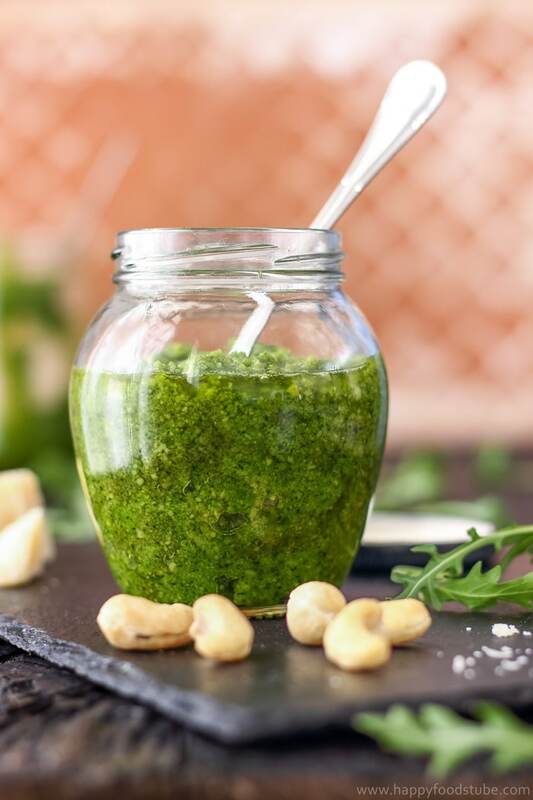 Cashew nuts – they are a must and altogether with arugula and olive oil create a great condiment. 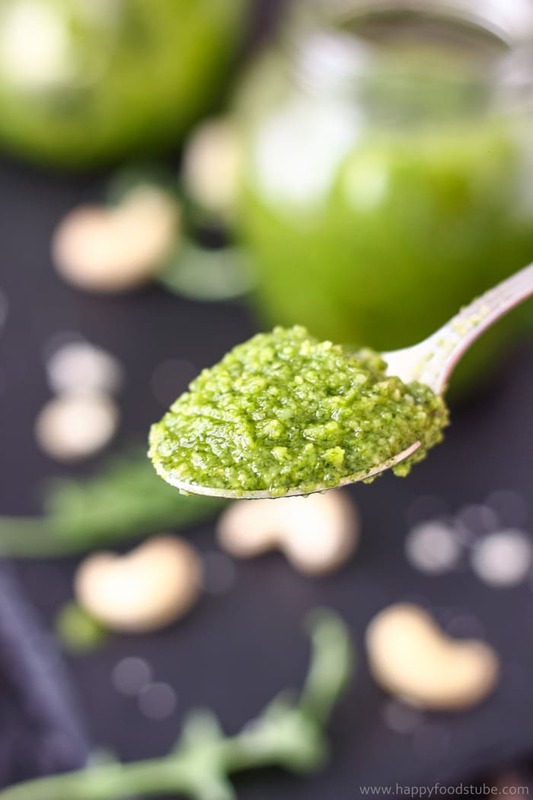 You could try using walnuts instead (I haven’t tried making this pesto with walnuts. Just bear in mind that they go rancid pretty fast so make sure you use good quality ones. Otherwise you can end up with bitter pesto, which is not a nice experience). In a food processor, process cashew nuts, olive oil, minced garlic and arugula until smooth-ish. At last stir in grated parmesan cheese or equivalent. Store in the fridge in a glass jar with lid. Not sure why I’ve never tried making pesto before – and to think I chucked half a tub of arugula (rocket ) in the compost earlier this week! You must do so, Lizzie! 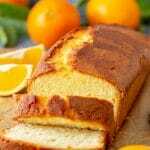 It is soo delicious! I have never tried arugula pesto! Sounds fantastic and it’s so pretty! I love the vivid green of this pesto. I would smear this all over grilled chicken or pan seared salmon! Delicious! I am definitely saving this one! I love arugula and pest but have never considered combining them like this! I love to use pesto and arugula to make homemade pizza and this is perfect! Yummy! I bet this pesto has a nice little bump in flavor from the arugula. 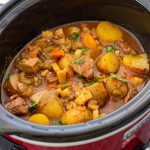 Looking forward to trying this recipe.